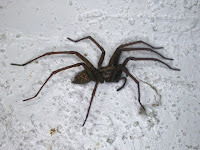 While I was away recently, there was discussion on the Web about the dangers of spiders in Britain. My first encounter with a spider that bit was in France when I was fourteen. At the time I was into geology, and picked up a piece of rock and started to examine it. After perhaps a minute, I felt a piercing sensation on my hand under the rock. I looked under the rock to see a medium sized spider biting me. It gave me a considerable shock. Whether it was a direct effect from the bite, or an emotional response I do not know, but I did feel rather flushed and dizzy. More recently my wife picked up that very attractive green spider Araniella cucurbitana and to her surprise, it gave her a nasty nip that was really quite unpleasant. Even more unpleasant was a nip from a harvestman that was nestling in a pot of chamomile she had bought from a local garden centre. I had never heard of harvestmen biting humans, but this particularly bite caused pain, and unpleasantness for some time. 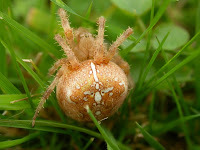 Certainly I have heard that other orb spiders, and house spiders belonging to Tegenaria can bite, but have only heard very occasionally from people who have experienced bites. 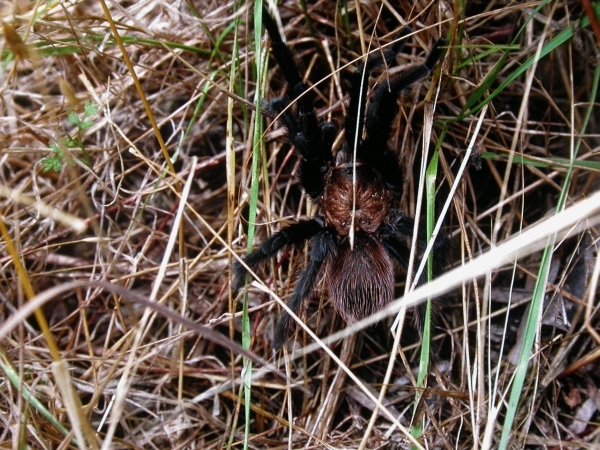 Perhaps one of the most alarming group of spiders on their appearance are the bird eating spiders, often erroneously called Tarantulas. People with experience of them are quite prepared to allow them to walk all over them. It appears that if bitten by them, the experience is not lethal, but on a par with the sting of a bee. It probably comes as a bit of a shock that there are as many as thirty-two species of black widow spider, and one, the Mediterranean Black Widow Latrodectus tredecimguttatus is not uncommon, and may be responsible for the Spanish dance, the tarantella, inspired by the death throws of someone having been bitten. However there is another black widow that occurs in Spain, Latrodectus lilianae which is common there. Australian spiders are noted for their dangerous habits. The Australian Redback Spider is in fact a black widow Latrodectus hasseltii. In spite of the world being full to abundance with so many potentially lethal creatures, they do not appear to have even the slightest negative effect on tourism, and certainly mortality from them rarely features in newspapers. Had a holiday maker in the Mediterranean received a fatal black widow bite, it would surely have been reported. The fact is, venomous spiders have to be positively encouraged to bite and most are unaggressive. Black widows are so called, not because they create widows amongst humanity, but because the male does not survive his act of reproduction. This summer, we were plagued by enormous numbers of lesser house flies Fannia canicularis. On occasions the kitchen was home to literally hundreds, and the spiders that lived with us in the house became much appreciated allies, and a few local characters. In the sitting room, there was Shelob, named after the character in Lord of the Rings. She lives in a small hole in a flower stand, produced an intricate web with a characteristic funnel, and frequently stands, upside down close to her hidey hole as we watch television. Another well watched creature is Spid. Spid appeared in about May as a tiny creature. He inhabited a tiny corner between the wall and the ceiling. He could be observed while I enjoyed an early morning cup of coffee. A record breaking move by him would total about an inch. Then one day he disappeared. He was away for about a fortnight, and during that time I anxiously hoped he was okay. Suddenly he reappeared, and now a little more active and slightly bigger, he actually strayed perhaps as much as six inches only to disappear again. He is now back in residence having returned from a walkabout something like a fortnight ago. 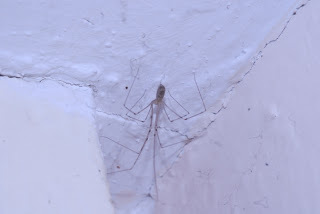 Our house seems to be inhabited by Spid and his relatives, now down to about four individuals, the occasional Tegenaria who appears unannounced in the bath and Daddy Longlegs Spiders, Pholcus phalangioides. Pholcus spiders are brilliant hunters and have been responsible for the demise of several of Shelob’s relatives. Their technique is to create subtle shivers in a web, and this encourages the web’s owner to emerge, thinking prey is available. At one time, a large Tegenaria took up residence behind our washbasin plinth. He was an expert fly catcher, and we christened him Charlie. On one occasion, it seemed he had been expelled from his home. I caught him in a jam jar and returned him to the vicinity of the loo. Immediately Charlie himself came out, and made short work of the interloper. In the course of time, however Charlie fell victim to a Daddy Longlegs Spider. 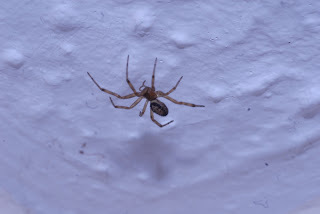 Very recently, and especially since correspondance concerning the False Widow Spider Steatoda nobilis and its potential for causing a most unpleasant bite to humans, I have taken photographs of a relative of Spid who has a home close to the kitchen window. His identification is unequivocal: he is a false widow, Steatoda nobilis. Actually he is probably a female, given that his markings are so strong. I have to admit to rather less warm and cuddly feelings towards Spid, Shelob and their relatives, however it appears, from studying their habits on the web, that they have to be positively encouraged to bite. One method, apparently, is to hold them between thumb and forefinger and gently squeeze against another part of the hand. Secondly as they have poor eyesight, gentle encouragement with a finger by vibrating the web, will encourage them to come out and bite. In a nutshell, they only really bite if provoked or in defence of themselves. 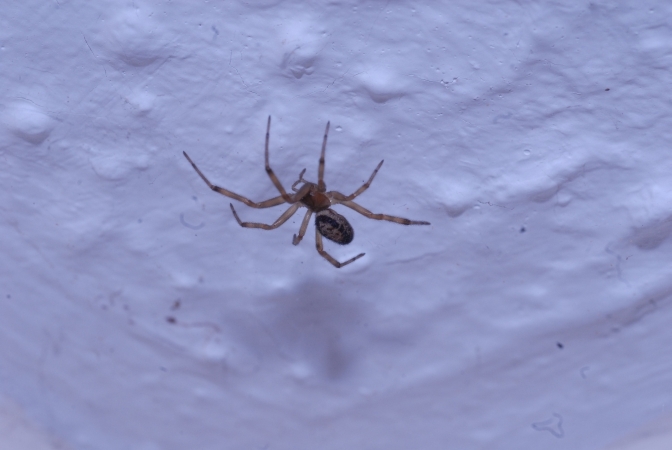 Apparently Steatoda nobilis is not a British native, but was introduced from the Canary Islands or Madeira, where it is native, some time in the nineteenth century with bananas. They are still more or less confined to southern counties, however are expected to spread north. It is now present in western Europe where it is expected to spread. Reports of False Widow bites do appear from time to time in the media, but most are sensationalised. As with bee stings, a few unfortunate people are badly affected by false widow bites, however to most, the effects may be painful, but are almost always harmless in the long term.